TRAINING IN JAPAN. By Derrick Kirkham. KARATE AND THE LAWS OF PHYSICS. By Grenville Harrop M.Sc. INSTRUCTORS SPOTLIGHT. ANDY SHERRY & JOHN VAN WEENEN. GEORGE BEST JUNIOR CHAMPION. Interview By John Cheetham. SENSEI SADASHIGE KATO 6th Dan. By John Cheetham. SHOTOKAN BOOK REVIEW & NEWS, COMPETITIONS AND REPORTS. MASTER NISHIYAMA'S DOJO USA. By Carmel Richards. CLUB PROFILE - HATHERLOW SHOTOKAN. 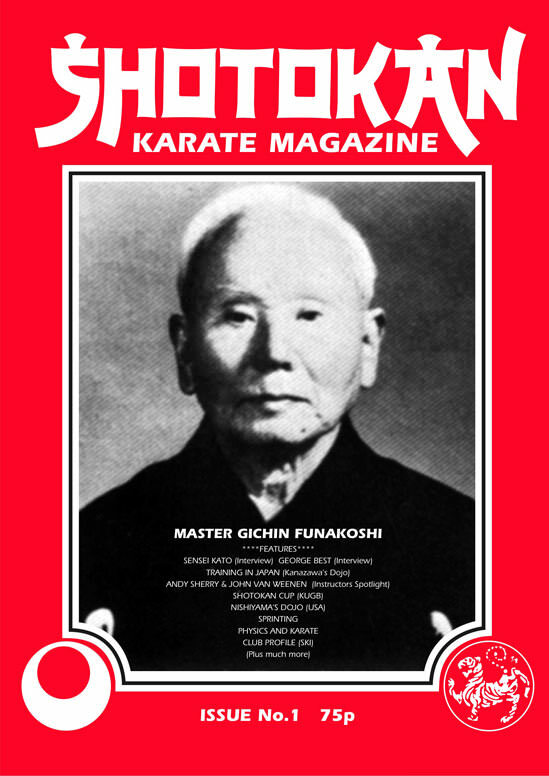 Welcome to the first edition of Shotokan Karate Magazine. As the title suggests, this will be a specialised publication for Shotokan practitioners, fans and enthusiasts. 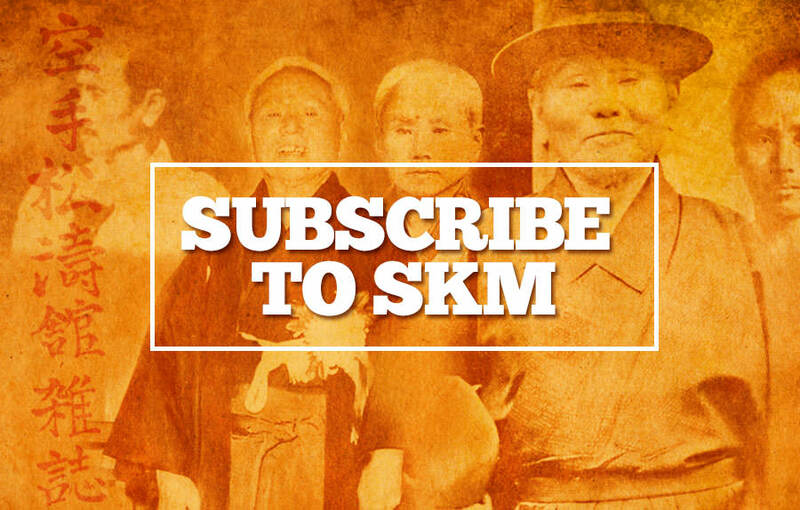 We will feature stories, interviews, technical articles, etc., on and by the top Shotokan instructors and competitors from all the various Shotokan associations, groups and organisations in Great Britain and abroad. Plus coverage of events, competitions, training courses, etc. I must mention the friendly, helpful response we have received from associations, officials and instructors. This shows that our aims are the same, to practice and preserve the true spirit of our common bond, SHOTOKAN KARATE. Information regarding your club or instructors etc, will be welcomed, all material submitted must be accompanied with a S.A.E. if return or reply is required. The views of the people we interview are not necessarily those of the editor. 'SHOTO', was the pen name of Master GICHIN FUNAKOSHI, the 'Father of Modern-day Karate'. Master Funakoshi was born in the town of Shuri, Okinawa Prefecture, in the year 1868. Not only was he a karate genius but also a literary talent and scholar of the Chinese Classics. His poems and literary work were signed 'SHOTO'. In Japanese 'SHOTO' means 'PINE WAVES'. As a young man, Master Funakoshi would often walk in the pine forests near his home to seek peace and solitude and to write his poetry. Close to his love of karate was his love of nature. Whilst listening to the wind blowing through the pines he decided to use the name 'SHOTO' as his pen name. In 1922 when he was president of the Okinawa Association of Martial Arts, he was invited to demonstrate karate at the first National Athletic Exhibition in Tokyo. This demonstration was so successful that he was asked to stay on in mainland Japan and teach karate. In 1936 the first ever karate dojo built in Japan at Zoshigaya, Toshima Ward, was named 'SHOTO-KAN' in honour of Master Funakoshi. 'KAN' means 'hall' in japanese. The money raised to build the new dojo was collected by a nationwide committee of karate-ka. The Japan Karate Association (J.K.A.) was founded in 1949 with Master Funakoshi, as the chief instructor. He held this position until he died in 1957 aged 88. From the main headquarters all the now famous names in SHOTOKAN KARATE were sent to all parts of the world to teach our style. In England at present we still have Senseis Enoeda, Asano, Kawasoe, Kato and Ohta, all were trained at the Japan Karate Association Tokyo Headquarters, on the famous J.K.A. instructors course.